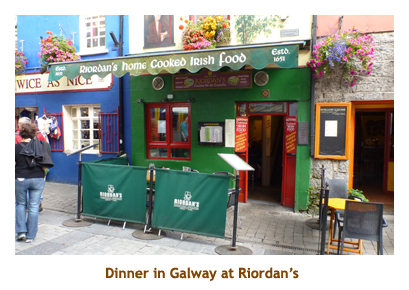 Galway was our first 2 night stop. So, no bags to put out in the hall this morning. Wakeup was at 7:00, breakfast at 7:45 and on the bus was at 8:45. Wow, a 15 minute reprieve! Irish law prevented our regular bus driver from driving too many days in a row, so today we had a temporary driver. It was cool, rainy and windy first thing in the morning, but it gradually got better throughout the day. 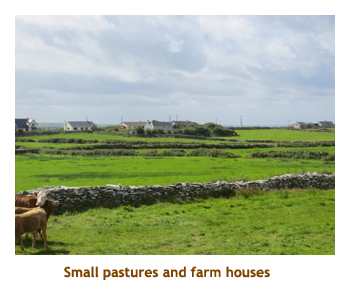 Today we would be exploring the Connemara coast area. 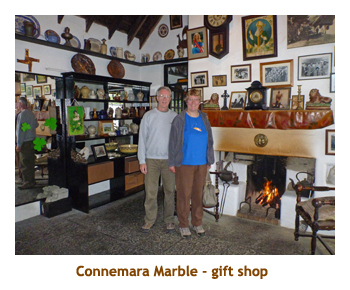 Our first stop was at the Connemara Marble factory. We were given a bit of a tour through the factory, but being a Saturday, nothing was running. They produced mostly green and brown marbles, but quite a range of shades and textures. 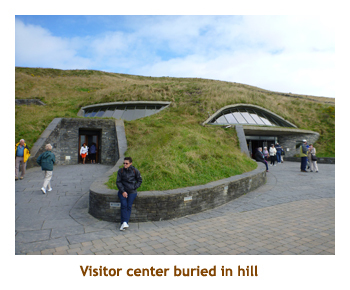 Across the street was an interesting gift shop with a peat burning fire place. 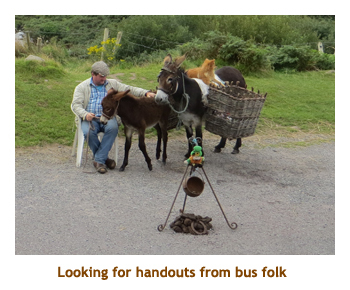 Then we reboarded the bus and headed out around the Connemara Peninsula. 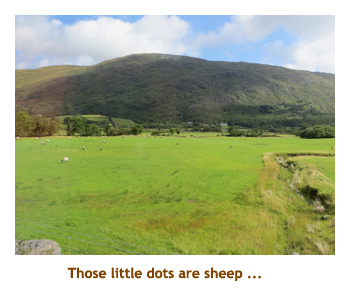 It was a beautiful drive through the rugged countryside - green pastures, herds of sheep, narrow roads. 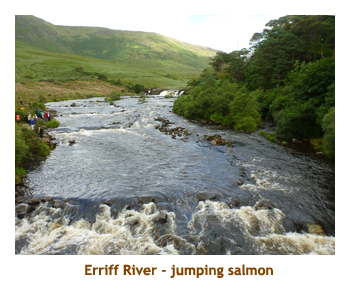 Our goal was the Kylemore Abbey, but along the way the bus driver took us on an unscheduled diversion to the Erriff river, where he has seen salmon jumping a few days before. We took a very narrow road and had a 15 minute stop at the river. From the bridge I saw 2 salmon jump. To be honest, I heard the splash and saw the ripples and assumed they were salmon! 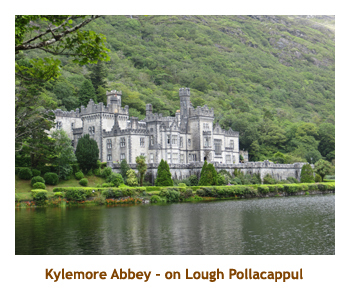 At 12:00 noon, we arrived at Kylemore Abbey, nestled at the base of Druchruach Mountain on the shores of Lough Pollacappul. The abbey was originally a castle built in 1867 by millionaire Mitchell Henry. In 1903 it changed hands to the Duke and Duchess of Manchester. In 1920 it was donated to the Benedictine nuns (ie. became an abbey). Today it remains a religious boarding school for girls. 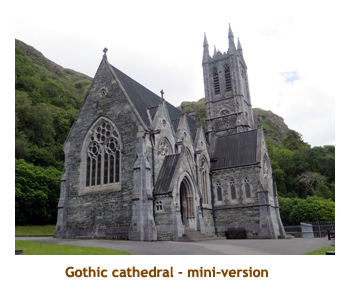 We were given 2.5 hours to visit the castle, the gothic church (1877), the Victorian garden and have lunch. As it was just after noon, we opted for lunch first. We popped into the gift shop complex and had salad and pizza. After lunch we walked over to the castle and did a guided tour through several rooms (a lot of it is not open to the public). We hiked through the woods to the little church, which was a mini-cathedral. Finally we retraced our steps back to the gift shop and caught the shuttle bus for the gardens. 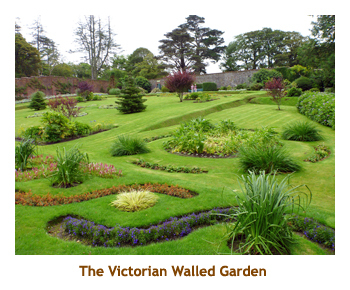 We had time for a quick walk through the splendid garden then caught the shuttle back to the park entrance. 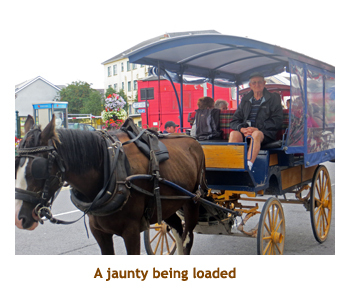 The we drove back to the town of Galway, taking a different route than we had come. 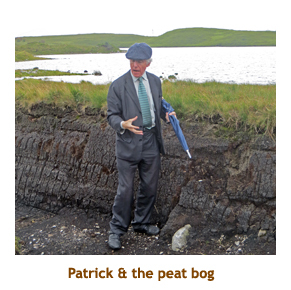 As we passed through some bogland, Patrick walked us into the bog and showed us where and how the peat was extracted. For the rest of the trip to Galway, Patrick read the second part of "The Quiet Man". In Galway (by 4:00 PM) the bus stopped at St. Nicholas Cathedral for a quick walk thru, We also drove by the famous Spanish Arch. 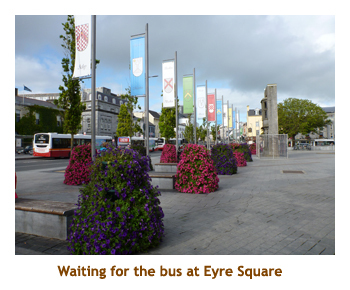 Then we were dropped off at Eyre Square where the JFK memorial is. We were given until 6:15 to wander the town. There was an optional group dinner tonight that we decided not to do. So, we found a restaurant and had our dinner (beef stew and Guinness). We enjoyed walking the crowded streets and found our way back to the square in time for the bus. Back at the hotel I read my book while Marjorie did laundry. There was a self service laundry room in the hotel. Very nice! 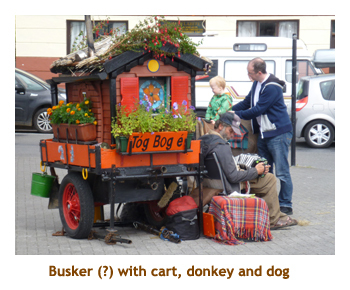 After our two night stay in Galway, it was back to no fixed address again. We had the usual wakeup at 6:45, bags out and breakfast at 7:30 and on the bus at 8:30. After we were boarded, Patrick informed us that due to his behaviour, Ollie, our regular driver had been fired. So, we started today with David, our new driver for the rest of the tour. 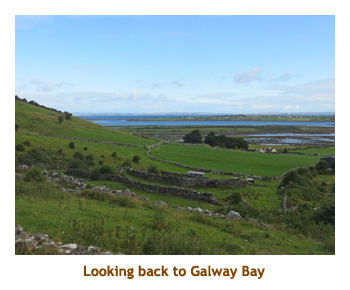 Our drive took us west along the southern edge of Galway Bay. Across the bay was the Connemara coast where we had bunked for two days. We past one of the many Irish castles, this one called Dunguaire Castle. 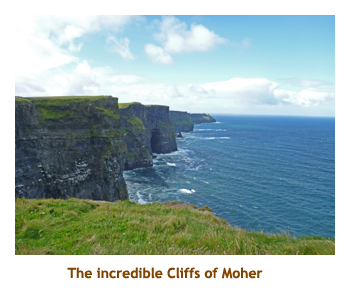 Then our road turned south along the Clare Coast, crossing the Burren and passing through Lisdoonvarna and on to the Cliffs of Moher. We stopped at the cliffs (about 10:30) and had two hours to wander and eat. 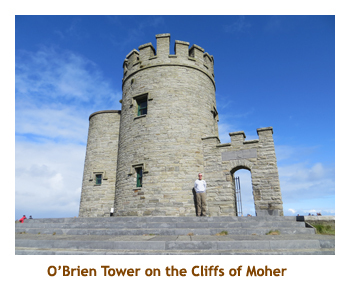 We took the steps up to O'Brien's Tower which gave the best view of the 700 foot high cliffs. It was windy, but the sun had come out and it was very pleasant. We wandered through a museum and gift shop and then had lunch in a cafeteria. Afterwards we had time to spare, so browsed through a couple of souvenir shops. Then it was 12:30 and time to be on the road again. 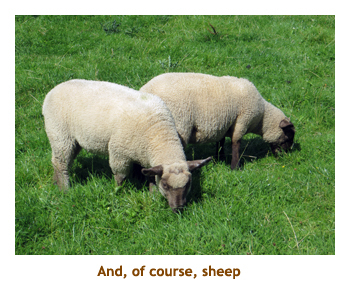 We were now leaving the cost and heading inland towards Limerick., Once again we were driving by green farms and fields of sheep. 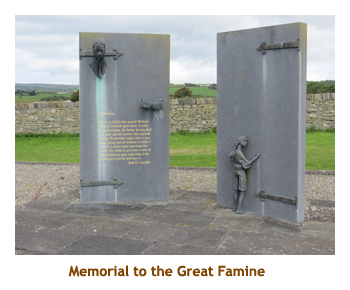 Along the way we stoped at a roadside memorial to the Irish people who suffered or died in the great famine of 1845 - 52. 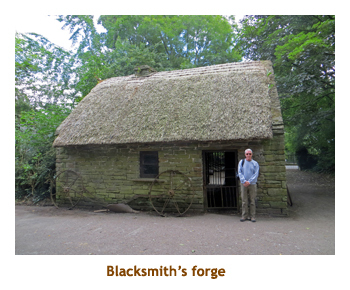 Just outside of Limerick we pulled into the Bunratty Folk Park about 2:00 PM. 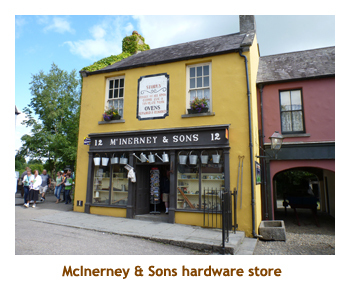 This was a reconstructed 19th century village highlighted by a large Norman castle built around 1425. We were given two hours for lunch and wandering. 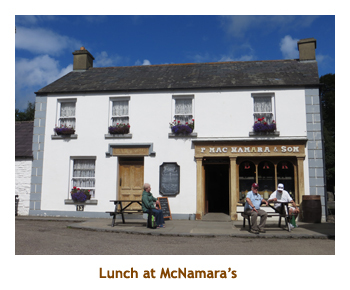 Being as it was early afternoon, we started with a fish & chip lunch at McNamara's. Afterwards we climbed the castle tower. 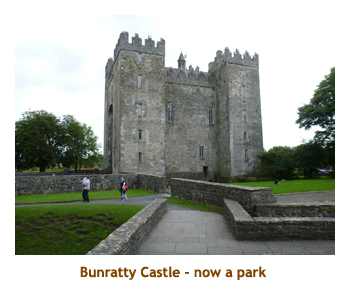 The castle has been reconstructed inside and hosts medieval banquets at night. It was 4 stories with several rooms on each floor. The banquet hall was immense. 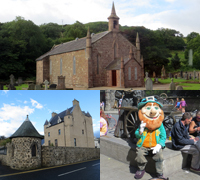 The sun came out and we spent the rest of the time wandering through the various village buildings, including a beautiful stone church (Ardcrony's Church). 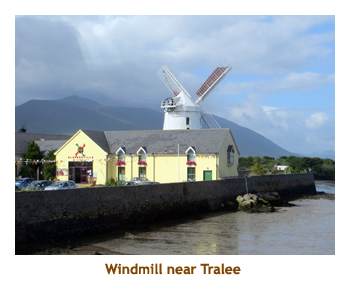 One area featured two grist mills - one a vertical mill (normal water wheel) and the other a horizontal mill (the water wheel is laid flat). 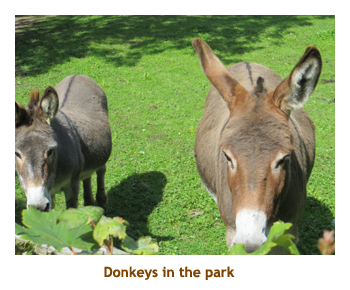 There were lots of animals too - sheep, donkeys, cows, goats, chickens, etc. 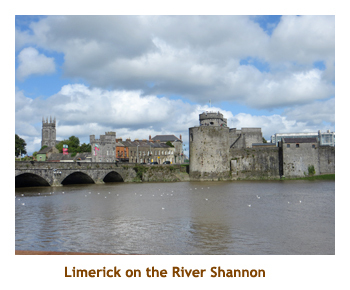 When our time was up we reboarded the bus and drove on to the town of Limerick, arriving about 5:00. 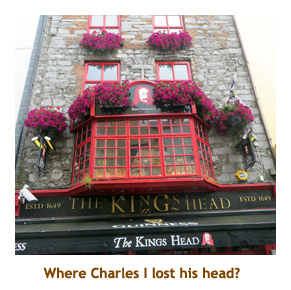 After checking in to the George Hotel, we wandered around the tourist area of town. 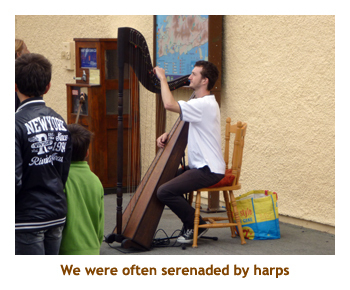 It was relatively deserted after the crowds we had encountered in other Irish cities. There was an optional medieval dinner excursion offered this evening, but we didn't attend. We were still feeling our lunch, so found a nice restaurant and just had an appetizer each. After a bit more wandering we returned to the hotel and went to bed. 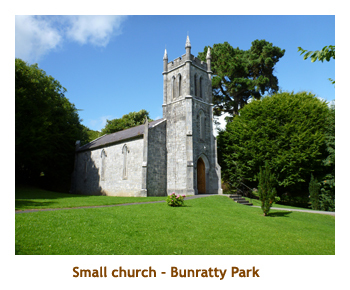 Today our target was Killarney near the southwest coast. It was an earlier morning; wakeup at 6:00, luggage and breakfast at 6:45 and 7:45 on the bus. We headed southwest on the N21. 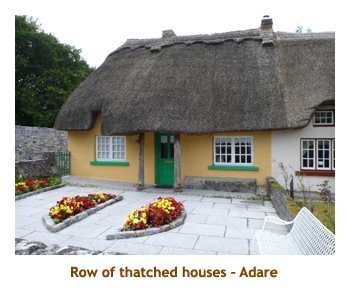 Our first stop was at 8:00 in Adare where there was a row of cottages with the traditional thatched roofs. 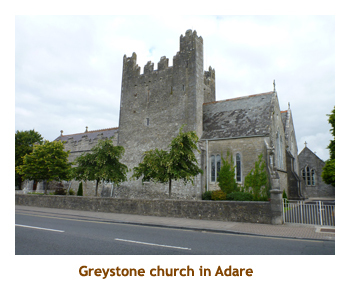 On the drive from Adare to Tralee, Patrick read to us an excerpt from "Angela's Ashes". Angela Sheehan (Frank McCourt's mother) was from this area. 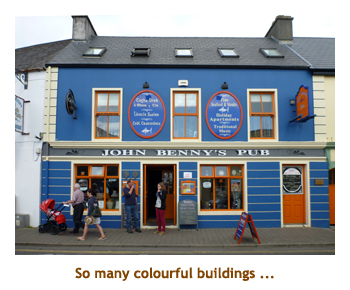 From Tralee we headed west to Anascaul, the home of Tom Crean. Tom was an Antarctic explorer with Earnest Shackleton and a member of Robert Scott's fateful excursion. 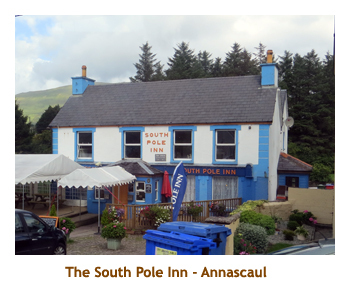 There was a South Pole Inn memorializing him in the town center. 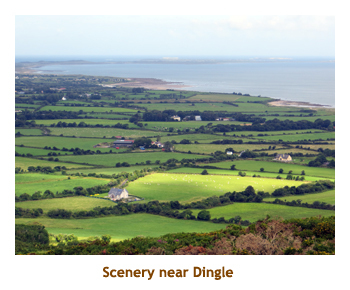 We continued through Dingle and to the start of the Dingle ring road at Milltown. The road around the loop is extremely narrow (mostly 1 car width wide), so by local agreement all traffic travels clockwise. However. it isn't legally one way, so we did meet some cars coming the other (ie. wrong) way. 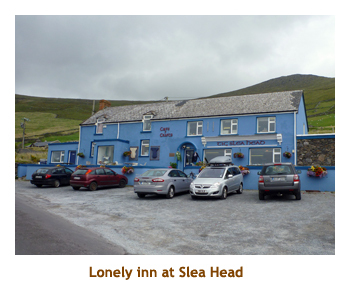 The road took us by Slea Head, the westernmost point on the Irish mainland. In the distance we could see the Blasket Islands. This area was the setting for the film Ryan's Daughter. The loop took us back to Dingle by about 11:30, so we stopped for lunch. 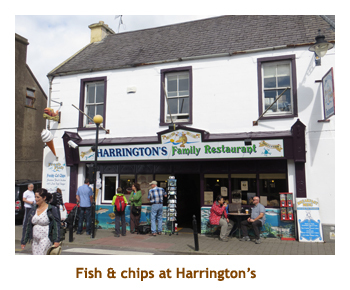 We had good fish and chips at Harrington's. Afterwards we had abut an hour to wander around the village. 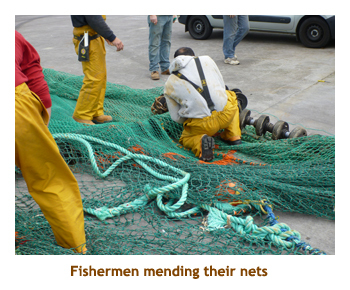 It is on the ocean and hence is mainly a fishing village. Patrick sprang for an ice cream for all at Murphy's Ice Cream Shop. 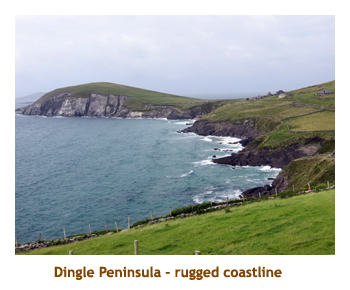 Dingle is famous for Fungie the (bottlenose) dolphin. This is a real dolphin who has made Dingle Bay his home. 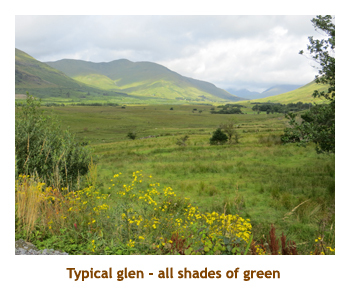 Then it was time to head east to Killarney. Along the way we stopped at a large sandy beach, but there weren't many people out (cool and windy). 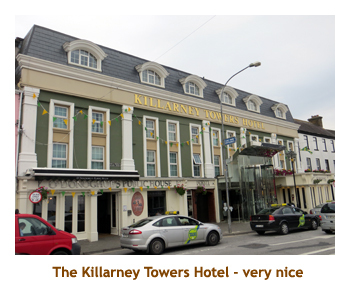 We arrived in Killarney about 4:30. 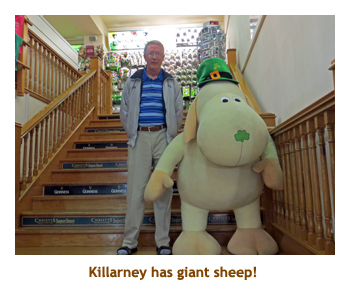 After we checked in to the Killarney Towers Hotel, we wandered out to the tourist area to check out the souvenirs. We found a large shop that had tons of stuff and bought a t-shirt and tea towels. We were back to the hotel in time for our 7:00 group dinner. The dinner was very good. We wandered the town a bit after dinner and then headed to bed. 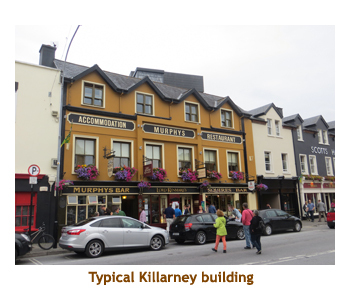 We would be staying two nights in Killarney - woohoo! Our wakeup for today was back to 6:45, and no bags had to be put out. Breakfast was at 7:30 and all aboard was 8:30. 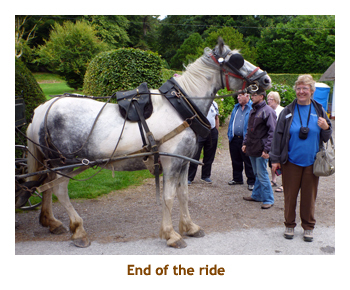 Our first outing for the day was a one hour jaunty ride through a national park that touched against the city. 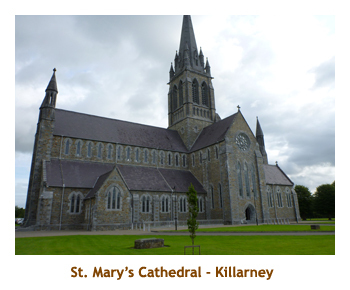 We stopped at St. Mary's Cathedral and had a brief look through it. On the green next door, they were having a dog show. 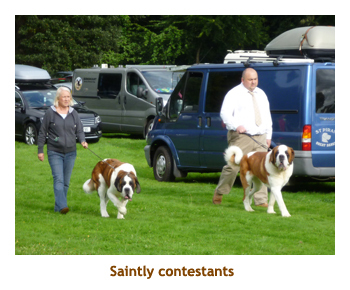 there were loads of tents set up and dogs of all different breeds. Several jaunties showed up for our group, each one holding about 8 people. We had a short ride along city streets before hitting the national park. Once in the park, we were on a dirt road leading through the forest. 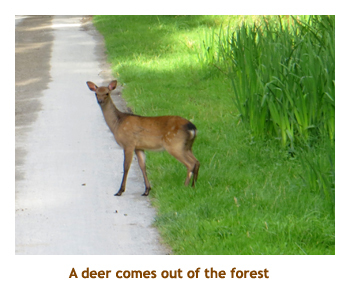 We saw several deer along the way and had glimpses of Lough Leane and Ross Castle. It was a lovely (if bumpy) ride. We did a loop that ended us back at St. Mary's. There we disembarked the jaunties and assembled for a group photo. 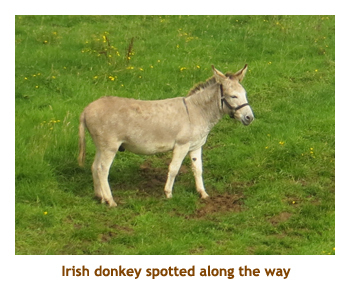 Then it was time to head off for the Ring of Kerry. We drove the N70, which is the famous Ring of Kerry road. 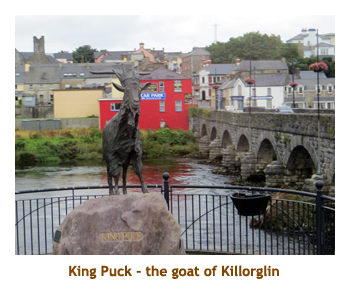 The first town we hit was Killorglin where we saw King Puck. This is a goat from an ancient (circa 13th century) ritual related to matchmaking. 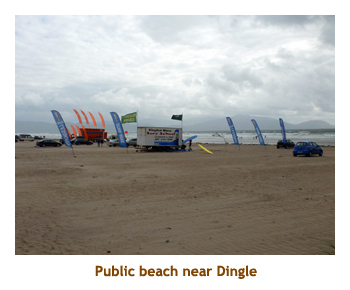 From Killorglin we travelled along the coast where we could see across to Dingle Bay where we were yesterday. At the western tip of the road we could see some nearby islands but is was too hazy to see the Skelligs. I was hoping to get a photo of Skellig Michael. 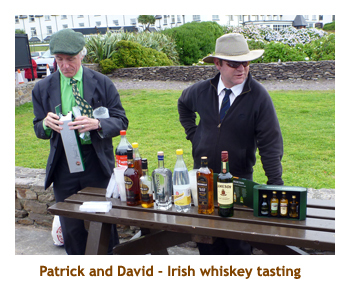 Coming around the bottom end of the ring road we stopped at a large beach at Caherdaniel where Patrick and David set up an Irish whiskey tasting. They had quite a variety of whiskies, but I must admit I didn't try one. The Irish Coca Cola was very good though. 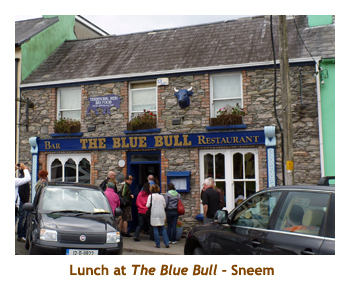 Continuing on, we hit Sneem about midday, so we stopped for lunch and a wander. We picked The Blue Bull and it was quite good. Finally we drove back to our hotel in Killarney. There was an optional dinner (that we did attend) at Kate Kearney's Cottage. 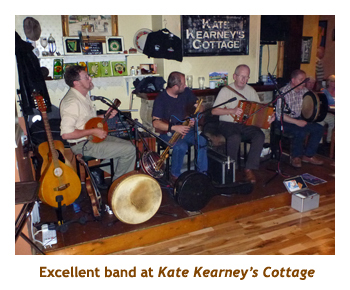 The food was very good and the live band and Irish dancers were excellent. A fun evening! Our trip was winding down now, with just a cou-le of more stops. 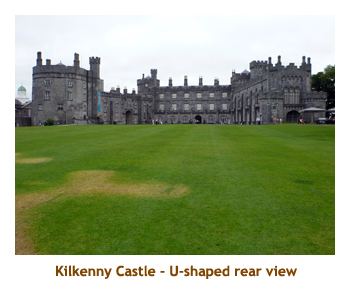 Today we would be driving from Killarney to Cork. Wakeup was at 6:45, bags and breakfast at 7:30 and checkout / all aboard at 8:30. 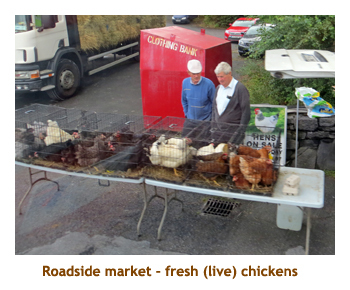 This was perhaps the least interesting of our long drives as we essentially drove east along the N22 without stop from Killarney to Cork. In the process we crossed the Derrynasaggart Mountains. 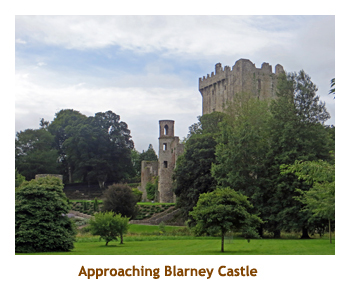 We did a tour through Cork city and then headed west to Blarney Castle. 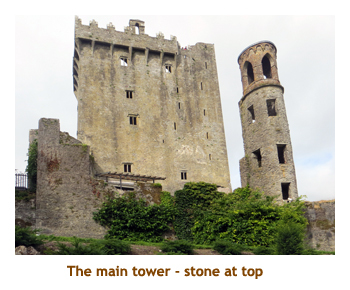 This is the famous 15th century castle that houses the Blarney Stone (Stone of Eloquence). We were given a couple of hours to tour the grounds. 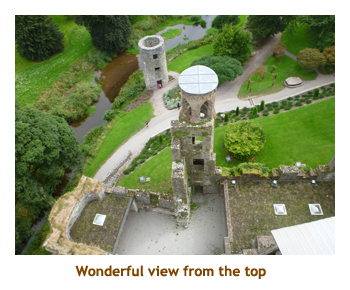 Marjorie didn't feel like climbing the castle tower, but I gave it a go. The place was really crowded and the spiral stairs up the tower were extremely slow (one step, wait a minute, another step ...). However, it was worthwhile and the view from the top was wonderful. 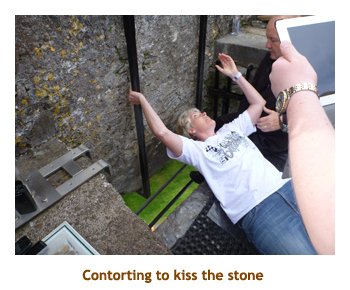 I walked by the "Blarney Stone" but did not attempt to kiss it! 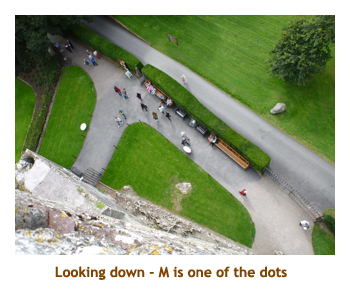 Looking down from the ramparts I could see Marjorie sitting on a bench far below. Coming back down was easy as the exit spiral was empty. Where did the people go? 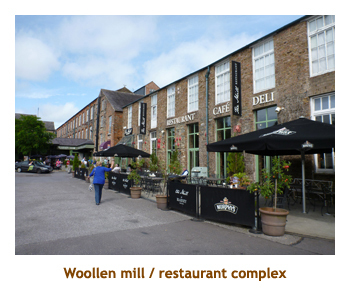 We had lunch (pizza) at a woollen mill / restaurant complex just a short walk from the castle. 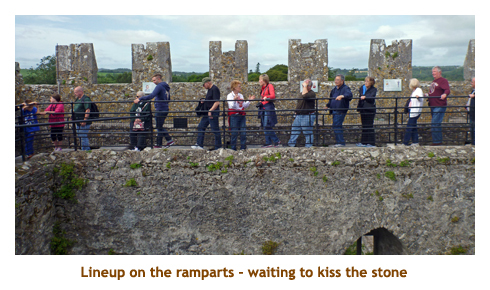 Afterwards we reboarded the bus and headed a bit farther from the city to Blarney Golf Club. 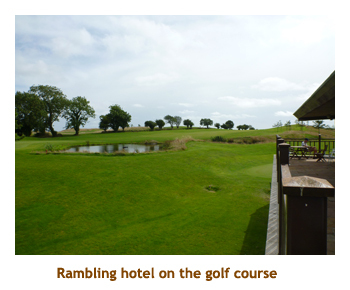 We arrived at the hotel on the golf course about 2:00 PM. 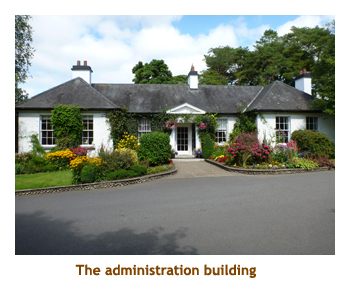 It was a huge hotel consisting of many 2 storey buildings spread out over the grounds. We checked in and the sun came out! Woohoo!! There was an optional afternoon tour to Cobh but we decided against it having been there several years earlier on a cruise. Instead we had a lazy sunny afternoon on the golf course. A few of our folks got up the energy to play 11 holes (for 15 Euros), but Marjorie and I just read our books. The hotel had a nice fitness center and I ended up doing a rowing workout. They had a C2 erg and I was really missing my daily sessions. That evening we had a group dinner at 7:15. It was extremely slow service. Our appetizers arrived at 8:15 and we were eating our main course at 9:00. We didn't wait for dessert to show up. We left the table, did a walk around the grounds and then headed to bed. Today was our final day of touring. Wakeup was 6:30, bags and breakfast was 7:15 and all aboard was 8:15. 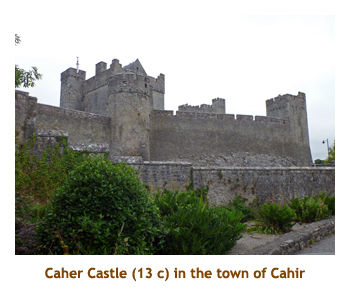 We drove for about an our before stopping at the 13th century Caher Castle, which was featured in the film Excalibur. 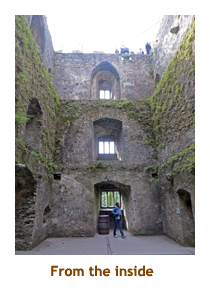 We walked around the outside of the castle but did not have time to go inside. 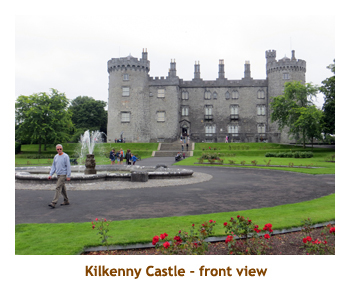 Then we drove on to the city of Kilkenny stopping to visit the 12th century Kilkenny Castle. 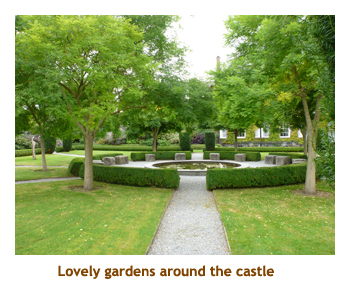 This was quite a large castle, in very good condition (still occupied) with a huge garden and grounds. We walked around the castle (didn't go inside) and also visited the Butler House on the castle grounds. 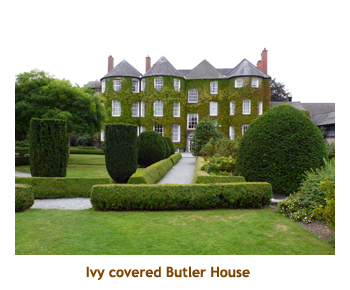 The former 18th century dower house is now a 13 room B&B. We had about 1.5 hours to wander the grounds and then were dropped off in town for lunch. We walked up and down the main tourist street and decided on Quizno's for a sandwich. Really Irish! After lunch we reboarded and headed to our next stop near Kildare. 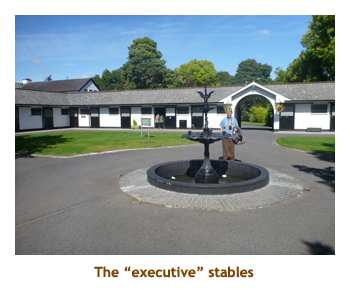 This was at the Irish National Stud, one of the country's main racehorse breeding centers. 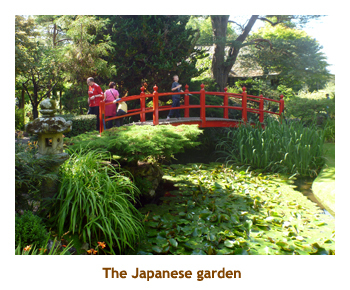 The farm is also noted for it's wonderful gardens, especially the 100 year-old Japenese garden. As we approached the parking area the sun came out and the temperature whizzed up into the 20's. Gorgeous! 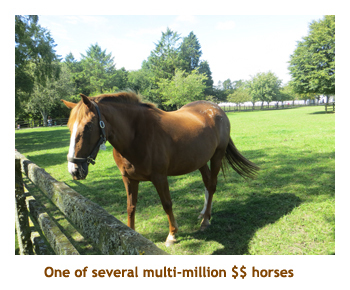 We were given a walking tour of the horse pastures where about 6 multi-million dollar horses were grazing. 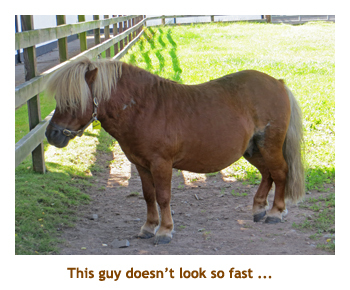 It wasn't the breeding time of year, so nothing much was happening. After the tour we were free to check out the stables and the beautiful gardens. I really enjoyed this stop. We reboarded the bus and drove the rest of the way into Dublin, coming full circle back to the DT Hotel from what seemed like eons ago. It was about 5 :00 PM so we checked in and then wandered up to Baggot Street where there was a Tesco and a fish & chip shop. Back at the hotel we repacked our things ready to fly out tomorrow. We did an early night (as always). 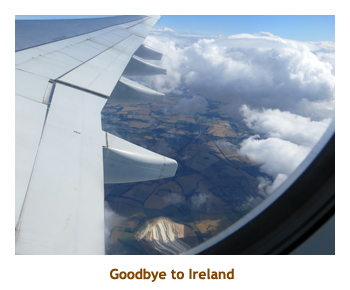 Today was our final day in Ireland. We were up at 7:00 and had breakfast.. Suitcases had to be out by 8:15 (we were doing the 9:00 bus to the airport). We said our goodbyes to those who weren't on the same bus. The bus was quite full, so 9:00 must have been a popular time. 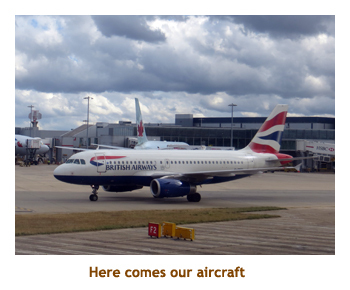 We arrived at the airport at 9:30 and went to the British Airways checkin. Checkin went quickly and so did security. We were at the waiting area in plenty of time for our 11:55 flight to Heathrow. The flight left half an hour late and we arrived in Heathrow just after 1:30. We got our luggage and then hiked over to the Central Bus Terminal. There was room on the next bus to Southampton (at 3:00). so we didn't have a long wait. The trip was a bit slow due to traffic, but we got to Southampton by 5:30. 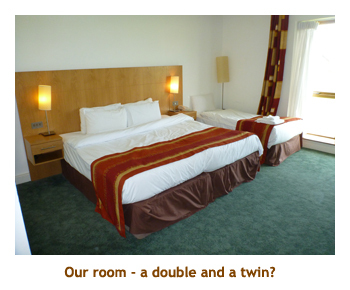 It was a short walk from the bus depot to the Premier Inn. After checking in we went to a nearby pub for dinner and then did the Tesco thing for a case of Coke and snacks for the cruise. If you are interested in the continuation of our journey, please go to our Spanish Cruise diary.